Like with previous Swedish royal christening portraits, there are four in this set. I have cropped these photos so that we can see the faces better, but if you want to view the un-cropped photos, you can do so here. 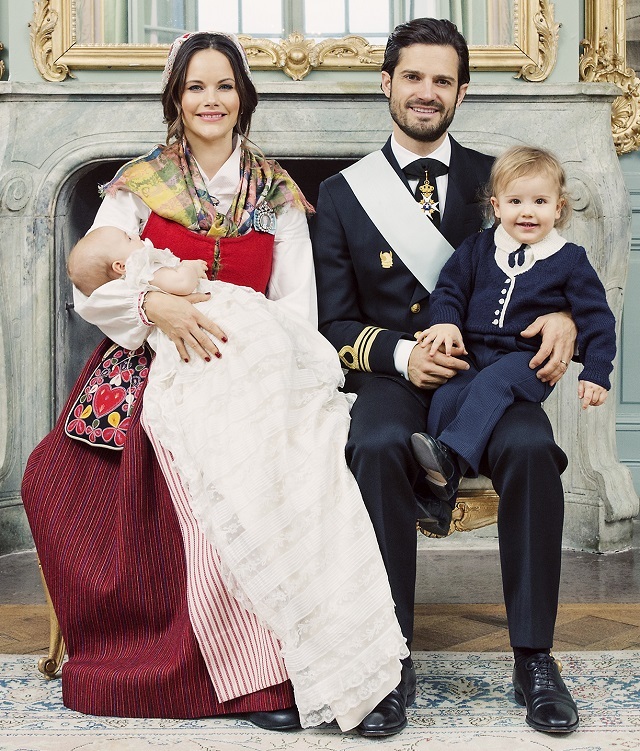 The first portrait is of the Prince Family: Prince Carl Philip, Princess Sofia, Prince Alexander, and Prince Gabriel. 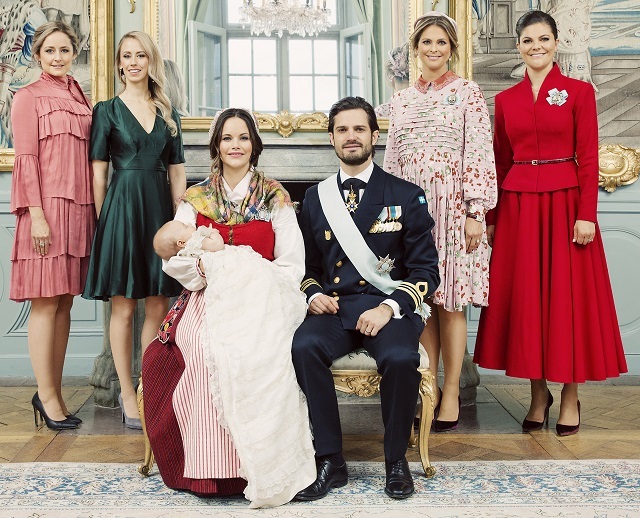 The third portrait is with Carl Philip and Sofia’s sisters: Crown Princess Victoria, Princess Madeleine, Lina Frejd, and Sara Hellqvist. The fourth portrait is of the Prince Family with Gabriel’s grandparents: King Carl Gustaf, Queen Silvia, Erik Hellqvist, and Marie Rotman. Lovely photos. It is so crazy that in a few months there will be seven little prince and princesses in this family. Can’t wait for a shot with all the children when they are a bit older. I was surprised how well all the colours fit together in the pictures. In the one with the siblings, Sara and CP balance out all the shades of red, in the one with the parents, Sofia’s dress is a nice pop of colour against all the blue. On the downside: WOW- Sofia’s parents look such much better/happier than Silvia and KG. He has just the best grumpy face (wondering if little Oskar got his ever unimpressed expression from him?) but she sadly looks like as if she had one or two things too much done on her face. To her defence she is more than ten years older than Sofia’s mother. Unfortunately, the only thing I notice from that last picture is the fact that Sofia’s mother needs to go up two or three sizes in her dress. Agree LizB. The tight dress really does look bad. I think Silvia looks lovely and Alexander is an adorable little boy. It must be a family trait! I used to say Sofia’s outfit was nice but needed to be a size or two larger. Good pictures! I especially like the one of the Prince family alone and the siblings one. I have to say, Madeleine looks SO MUCH BETTER without that coat. Also, I 2nd Caroline about the colors all going well together. Oh, I think Alex’s hair looks adorable. He’s a darling child. Agree with you about Sophia’s mom’s dress. Not good. Hope your little girl’s haircut goes well. 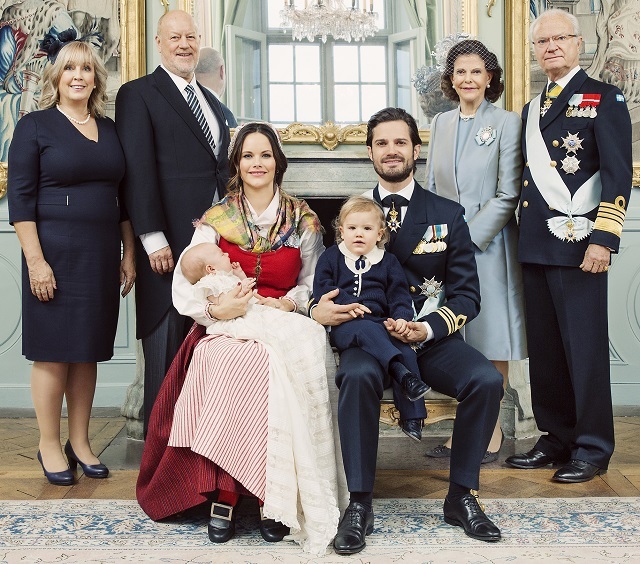 Prince Carl and Princess Sofia are not looking in the same direction. I love pictures with the whole family. The most precious things to look at when children are older. 1.) Why has Sofia chosen traditional Swedish dress for the occasion? She didn’t do this with Alexander, and to my knowledge, neither Madeleine nor Victoria wore this for either of their own children’s christenings. I’m not Swedish, so I don’t know, but is there something special about this day in particular? Was the date of the christening a national day? That’s the only thing I can think of to explain the departure from the norm. 2.) I had always imagined that November in Sweden would be terribly cold. Snowing, even. And yet, I can see bare legs in nearly all of the women pictured above. This, I’m assuming, is another thing I’m missing about Sweden. Would a helpful poster please advise? For your second question: they didn’t spend much time outside and from experience I know that nylon tights keep surprisingly warm for a short time. This skirt length is kind of an European standard for most occasions (birthdays parties, weddings, christenings,…). We don’t wear long skirts a lot (apart from summer dresses). And the Nothern Europeans (or more cold blooded ones) are really not bothered to spend 15 minutes in the cold in an outfit like this. I mean they mostly wore coats. No comparison to what you see in the winter in the queue at clubs in England. Now, that is when I wonder how those women don’t freeze to death instantly. 1) Gabriel’s dukedom is where Sofia is from, so I assume her wearing the local dress from this region to be because of this. 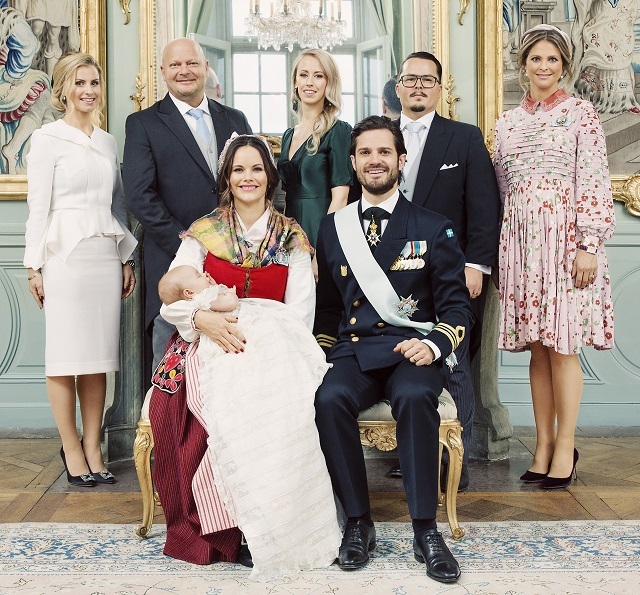 An actual Swedish poster pointed out that it’s normal for non-royals to wear the traditional dress for special family occasions. 2) It was 40° F the day of the christening in Stockholm… I guess stockings/tights are not so much the style for the SRF, unlike the BRF. 40 F is really quite warm by North European standards. By this time the body is already adapted to cold, and this temperature does not seems anything especially chilly. That makes sense that she would have worn it, then, for this christening but not the last. I had wondered that too. Love these photos. Maybe because more people are wearing brighter colors that it doesn’t look as washed out as previous christening photos. I kinda thought Victoria’s outfit was a bit too much. My fave was the lady in green thought it doesn’t really seem like a dress you’d wear to a christening. I agree with CP Vic’s comment and looking at Vic’s feet, I always remember Queen Mathilde. I do appreciate the Duchess of Cambridge since her feet are always tightly close when she poses. If Kate wore red to anyone’s event, that’s all we’d be talking about. Why does Sofia’s mother have a different surname? Are they divorced? I think this may be common in Sweden? I wish they would have held the baby so you could actually see his face. I complain about a lot of the pics that WK release but at least on the christening pics you could see their faces. I thought that, too. But then I looked at the pics more and I think Gabriel is asleep in the photos. So I can understand not wanting to wake him to take photos showing his face. Queen Sylvia looks best. She must have been extremely beautiful when she was younger. She was very pretty. it’s funny because in some pics Victoria looks just like her, and in other photos all you see is Madeleine! What a lovely family. Great photos. I hope someday they take a professional photo of all the grandkids together. Like the one the BRF did, but not so somber. I was not a fan of the ones from the BRF (was it Annie Leibovitz? )… too dark for me.